The A7 is the second liftback model launched by Audi recently. 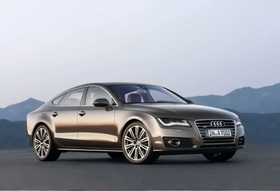 Audi has unveiled the new A7 -- a sleek, upmarket liftback previewed by the Sportback concept at the 2009 Detroit auto show. The A7 aims to provide the company with a stylish but practical rival to contemporary four-door, coupe-styled cars such as the Mercedes-Benz CLS and Jaguar XF. Revealed at a gala presentation in Munich on Monday, the A7 is the second liftback model launched by Audi recently, following the smaller A5. The new four-door is being looked upon to significantly boost Audi's market penetration in the United States when it goes on sale in North America early next year. The car will launch in Germany toward the end of the year with prices starting at 51,650 euros (about $67,125). Drawing heavily on the earlier Sportback concept for inspiration, the A7 displays elements of Audi's current design lineage, where it receives a prominent single-frame grille. But, it makes a decisive break with current Audi models at the rear with a heavily sloping window and trunk lid, which are integrated to provide a large, electronically operated liftback-style tailgate that provides easy access to the trunk. The A7's mechanical underpinning is a development of the company's Modular Longitudinal Platform in an arrangement that will also be used by the next-generation A6 -- alongside which the A7 will be produced at Audi's Neckarsulm factory in Germany. Using a conventional monocoque structure rather than the expensive space-frame arrangement seen on the larger A8, Audi has provided its newest model with a range of weight-reducing measures, including aluminum front suspension towers and a part aluminum body.